I'm going to try and use a small IF can to build my probe. I'm taking photos. Tomorrow another trip to Radio Shack. 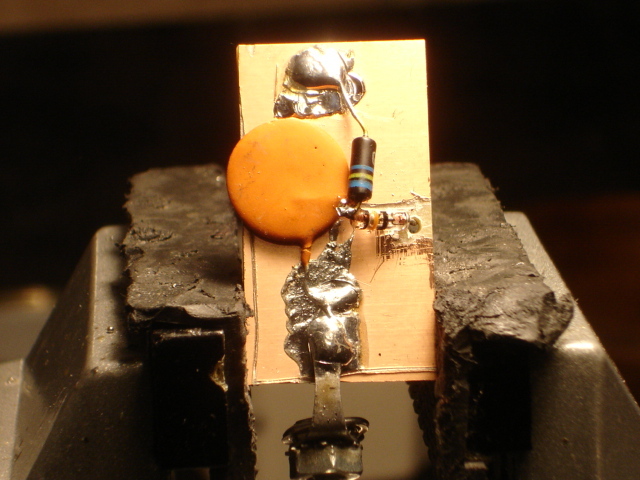 I found a circuit that uses a diode, 47M resistor and .01mfd disk cap. I used my other tracer without a probe, just the RF jack. I got my amp kit today. The instructions are in a foreign language and it is missing parts. Not good! The only guide is a photo from on top. There is no way to tell the values. Oh well, there is a schematic. I picked up a piece of double sided circuit board for my probe. I have some reservations about this. I should have spent the $35 for the one on eBay. I built it, turned it on and it played for about 3 seconds and it popped off. Frustrating! Disc capacitor and, long length combined may cause hum. What voltage capacitor did you use? Bill Cahill wrote: What voltage capacitor did you use? Oops- hit send too soon. I claim dementia. I have smaller disk caps but they are low voltage. I tried to keep the leads as short as possible. Remember this is going in that IF can. Should I just buy this? I may have missed it, but I don't remember if you told us what schematic you are using to build this? Any chance of a link to the schematic so that I can educate myself? Thanks Terry. I'll keep following along. Darn! I'm about to give up. My poor attempt will never work. The kit I was looking at is only for DVM. There is a beat up old Heathkit signal tracer on eBay. I should just get that. One of the main reasons I bought this was to repair my GE console. This is not going well at all. There was a Heathkit signal tracer, in bad shape and for parts only on eBay. When I went in it was $50. I put in $85. I was out bid at the last second, probably by a Snipe program. I really hate that program and I've even used it. Why bid when you are locked out in the last few seconds? It kind of defeats the whole auction concept. So far I have spent well over $200 to get my GE Console fixed. It still doesn't work, and the prospects are poor. Dumb! terrydec wrote: Should I just buy this? You should definitely buy that one. Ah- An update on that. I contacted the seller and it is only for Digital voltmeters. Totally unsuited for RF. The diode goes the wrong way. At least that's how they described it. Here's how obsessed I am. I almost paid $80 for a probe. I must be sick. Probably too much ink in my blood. That Tenna tracer came from MCM electronics. I have one just like it at work. Good little unit. I built a tracer back in the early 80s out of an old transistor radio that had a bad case. I found the info on how to build it from one of the 80s electronic magazines. I put it in a old car CB case I gutted for it. I used the CB speaker and built a 9 volt supply. The thing still works like a champ. A tracer and generator are my 2 most used test pieces on radios. It just gets weirder and weirder. There is now a Tenma exactly like mine, only with the elusive probe, on eBay. If it wasn't in auction I might try and get it and sell mine. If you want to build a tracer and have a somewhat working am radio here you go. I made one around 82 and I still use it.It works really great. willy3486 wrote: If you want to build a tracer and have a somewhat working am radio here you go. I made one around 82 and I still use it.It works really great. Okay. Crunch time. Let's see how many are still paying attention, or even care. I finally have a decent signal tracer, with RF input and everything. I just don't have a demodulator probe. Now- The instruction manual refers to two different test leads and the Tenma on eBay shows a probe. So it does need a probe for RF. The manual also gives instructions for aligning AM and FM circuits, even in tube radios, so it can, theoretically do this. Yes, and, no. Why don't you just buy the one on ebay? Bill Cahill wrote: Yes, and, no. Why don't you just buy the one on ebay? It's an auction. I haven't won an auction in ages.